5 Acres & A Dream. It was meant to be a record of the remodeling of our 1920s farmhouse. As I added rooms and projects, the page eventually became too large and difficult to navigate. So I started this site. You can view the original floor plan below with links to photos of the rooms as we first saw them. Our five acres came with a 1920s bungalow that had been neglected for quite awhile. Originally we thought we would do a complete restoration, but quickly figured out how expensive and time consuming that would be to complete. We finally decided that we weren't really after a showpiece, but a comfortable home which meets our lifestyle needs. Slowly but surely, we have been making repairs, doing upgrades, and remodeling. Most of it we're doing ourselves. 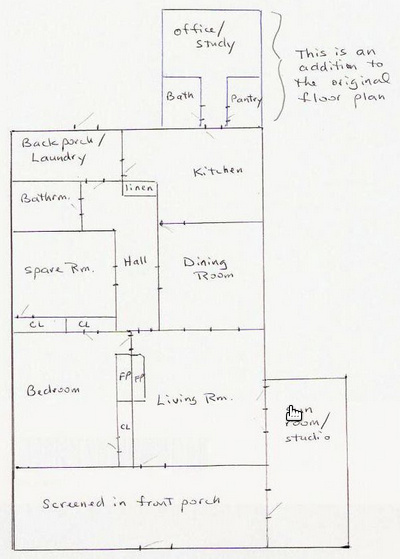 Below is the original floor plan with links to all the rooms as we first saw them. The house is approximately 1500 feet. Here are links to each of the rooms as we first saw them.